The story of the Comptometer starts off in a straight forward way, but becomes complicated in its latter days. The Felt and Tarrant Manufacturing Company, Chicago U.S.A., was founded to manufacture the Comptometer, invented by Dorr Eugene Felt and patented in 1887. This machine was the first truly practical and commercially successful adding machine, with the first serious manufacture and sales occurring in 1888. The Comptometer proved to be a very successful adding machine. There was steady development and this type of machine was produced into the early 1970s. Felt and Tarrant also diversified into leisure goods and developed the "Electrowriter", a special pad which could transmit whatever was written on it to a remote receiver. In 1957 the name of the company was changed to Comptometer Corporation. However, in the difficulties following the Second World War, Britain and the British Commonwealth put restrictions on the importation of many manufactured goods including Comptometers. Sales to this area had previously been a profitable operation, accounting for 25% of Comptometer's total production, and this loss from it's Chicago plant seriously affected the profitability there. In 1960, following a management reorganisation, the operation in England, including the right to the Comptometer name in England, was sold to the British company Control Systems Ltd., which merged it with its own subsidiary to form Sumlock-Comptometer. Comptometer Corporation then contracted with Control Systems to have all its machines made by Control Systems in England and shipped back to the U.S.A. This resulted in all Comptometer production ceasing in Chicago in 1961. There were further financial difficulties at this time, exacerbated by the development costs of the Electrowriter, which resulted in a merger with Victor Adding Machine Company to form Victor Comptometer Corporation in 1961. Comptometer model J, Sterling currency (£sd) version. The Comptometer was the first successful key driven adding and calculating machine. "Key driven" means that just pressing the keys adds the numbers entered to the total - no other action is required - so it is very quick for adding long lists of numbers. The basic function of the Comptometer is addition. There is a column of keys (in general 1-9) for each decade. When a key is pressed, that number is added to that decade, with carry to the next higher decade, if applicable. Pulling the lever forwards clears the total to zero. Comptometers were very fast in operation when adding up lists, such as required in accounting. Operators were specially trained to make use of the full keyboard and enter each number by pressing all the digits in one go using all fingers, as necessary, at once. In other words all the digits were entered in parallel, the mechanism being able to cope with this. Comptometers were widely used into the late 1970s and were ousted by advances in the use of computers for accounting rather than the development of electronic calculators. People trained in the proper and swift use of Comptometers often kept using them for many more years since for adding up lists they were quicker than a standard ten-key electronic calculator. 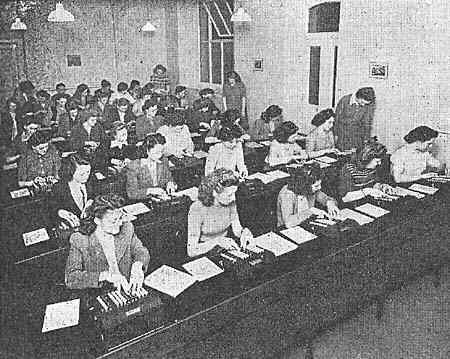 This photograph is from the British journal "Office Magazine" for January 1955 and has the caption "Over 180 girls a year pass through the Liverpool school for Comptometer operators run by Felt & Tarrant Ltd. Course normally lasts three months, but there is a shorter course, provided free, which covers three weeks and deals with one specific application of the Comptometer". Courses were run in dozens of schools for Comptometer operators (and by the Comptometer's competitors). These courses taught techniques for performing calculations quickly and efficiently. "News File", Office Magazine, July 1960, p719. Darby, Edwin 1968, "It all adds up: The growth of Victor Comptometer Corporation", Victor Comptometer Corporation, pp124-126.